While he was on the campaign trail, President Donald Trump promised to grow the country's economy by more than 4% per year, a rate not seen since the mid-2000s. On Friday, his prediction came true. The government reported that gross domestic product grew at a 4.1% annual rate in the second quarter, up from 2.2% in the first quarter. By many metrics, the economy is in excellent shape: Unemployment is near an 18-year low, factories are seeing more orders, and exports are surging. But analysts also warn that the exuberance might be short-lived, since the quarter's big numbers will also reflect a rush to stock up on supplies and move inventory in case a trade war makes them more expensive. "Enjoy the 2Q GDP number, which may be the last best print for a while," wrote Andrew Sheets, a strategist with Mortgage Stanley, in a note to clients over the weekend. "We think that 2H will follow a different storyline, with decelerating growth and rising inflation across major regions." In another worrying trend, while Trump's assertion that America has "the best financial numbers on the planet" is mostly right, slowing growth in other countries doesn't bode well for the United States. Earlier this month, the research firm IHS Markit said that trade tensions are compounding pressures from high oil prices and rising interest rates, and it projects that US growth will slow to 1.7% by 2020. Of course, nobody knows exactly how things will go. Here are four charts explaining what's happening in the economy today and how they may impact the future. At just 4%, the US unemployment rate is as low as it's been in decades, and there are now more open jobs than there are workers to fill them. 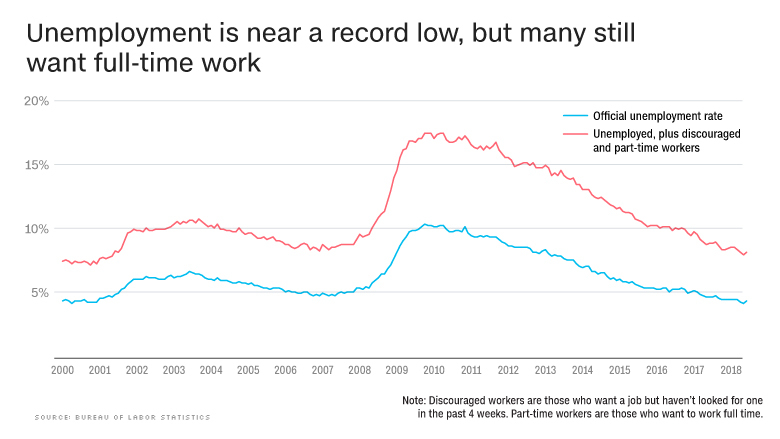 However, the number of discouraged workers — those who want a job but stopped looking because they couldn't find one — and the number of part-time workers who'd rather be working full time are higher now than before the recession. That may be part of the reason why wage growth has stayed flat over the past year, according to one measure released by the Bureau of Labor Statistics. Another measure shows wages have grown by about 1.2% over the year, but that's still not enough to get workers out of the hole they fell into during the recession. 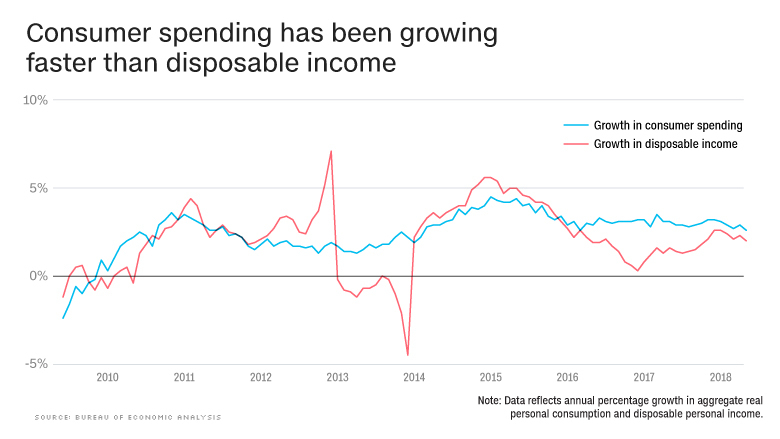 Consumer spending accounts for two-thirds of the United States economy, and it's been reasonably healthy over the past few years. But it's also been growing at a faster rate than after-tax incomes. As a consequence, people aren't putting away as much as they probably should. Savings as a percentage of disposable income is 3.2%, near its all-time low of 1.9% in 2005. If another recession were to occur, Americans might not have enough financial cushion to weather a job loss or other financial hardship. 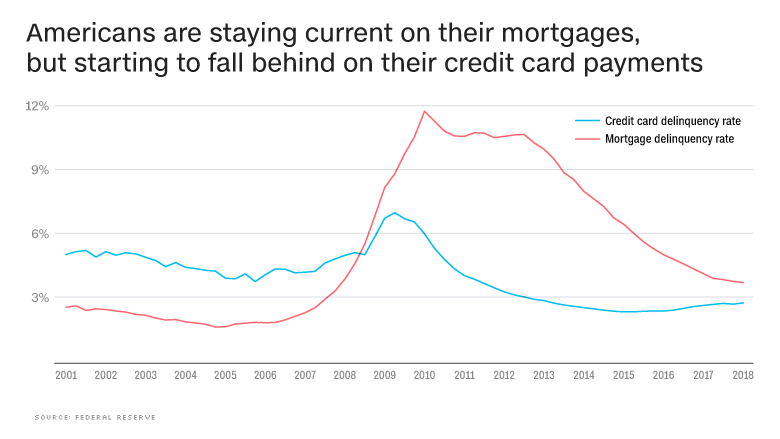 Another sign that Americans are starting to overextend themselves: After nearly a decade of shedding debts and paying off loans, they're racking up credit card balances and starting to fall behind on payments again. Meanwhile, the number of foreclosure starts is as low as it's been in 17 years, according to real estate data analytics firm Black Knight. Yet the mortgage delinquency rate is leveling off at above where it stood before the housing crash. If it remains above historical norm, that could be a sign of enduring housing stress, likely caused by inflated home prices. Overall, consumers are spending more of their income on debt service payments, which will only get worse as interest rates start rising. Trade-sensitive businesses might be nervous about the future, as the Federal Reserve's most recent Beige Book indicated. 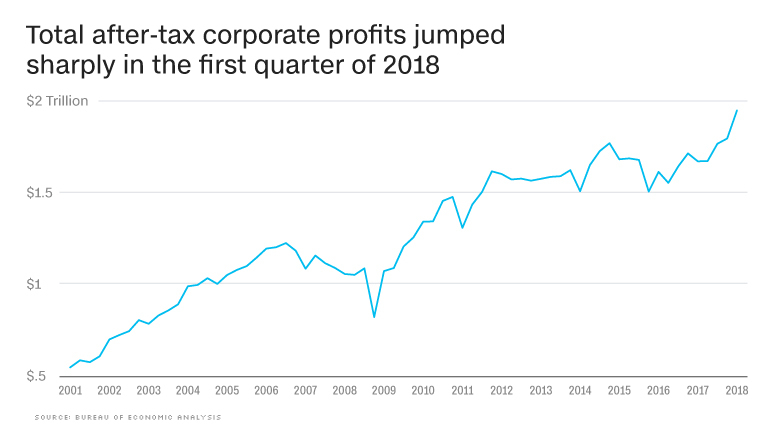 Still, second-quarter earnings have been coming in very strong and after-tax corporate profits spiked in the first quarter of this year, due in large part to the lowered corporate tax rate. While much of that extra cash has gone back into stock buybacks and mergers, capital expenditures have also been strong, which the White House is counting on to help raise wages. 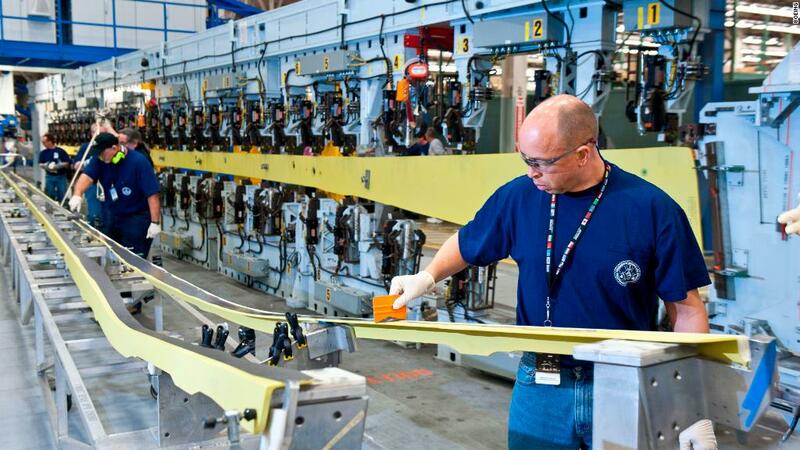 Council of Economic Advisers chairman Kevin Hassett has argued that corporate investments in machinery and technology will make workers more productive, allowing companies to pay them more (though left-leaning economists say that relationship no longer holds). Despite some of those underlying weaknesses and trouble signs overseas, America still looks to be in solid shape. "We just don't have any evidence that the US economy is turning negative at this point," says Lisa Emsbo-Mattingly, director of research in the Global Asset Allocation group at Fidelity Investments. But as the year progresses, she says, that could change if it turns out that companies really are stocking up in case trade battles get worse. "My hunch is that corporate America knows what's coming down the pike." Correction: A previous version of this story incorrectly reported the first quarter GDP figure.